One of the many things I love to do at Christmas is to make some gorgeous sweet treats such as fudge and biscotti to give as gifts. I’m a real sucker for great packaging and I even like the things I make to be packaged nicely. That’s when I came up with the idea of using upcycled tins for this years Christmas sweet treats. Over the year I have amassed quite a collection of ugly tins from coffee tins to danish biscuit tins. 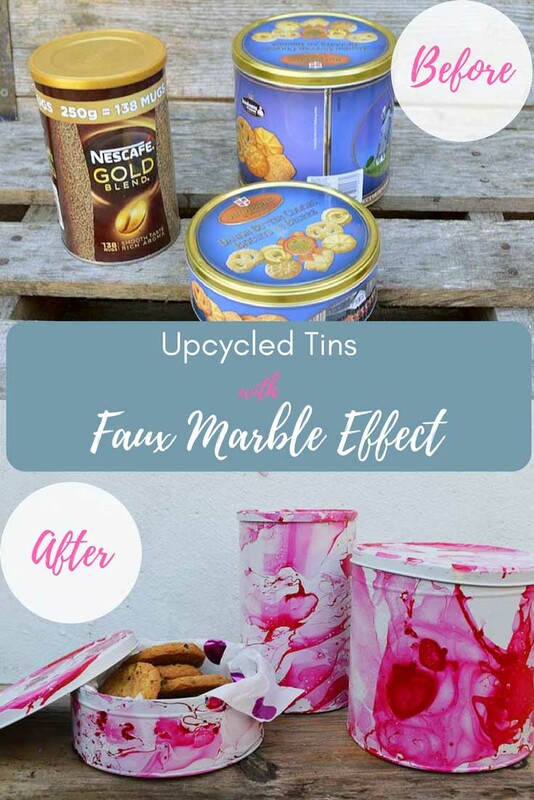 I love the popular faux marble effect in home decor and decided to recreate this with my upcycled tins. The finished faux marble effect is amazing considering how simple it is to create. 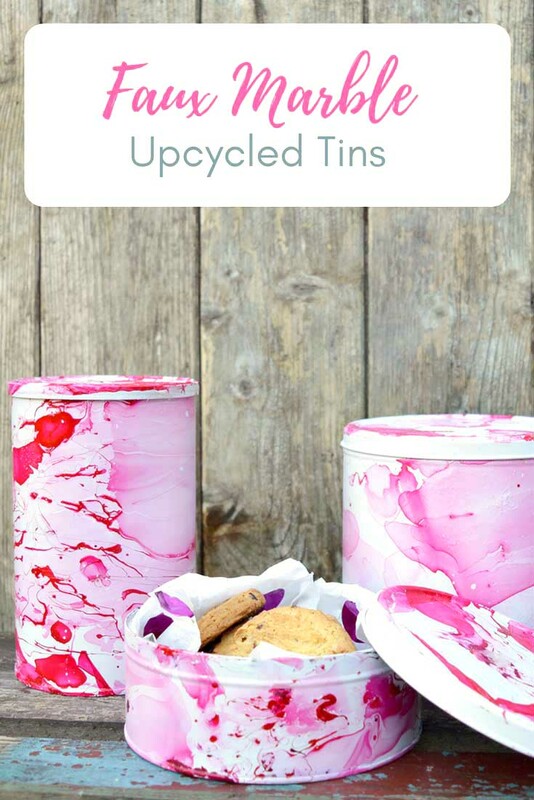 My upcycled tins are like a gift in themselves, I will be using them for other things a not just posh looking cookie tins. 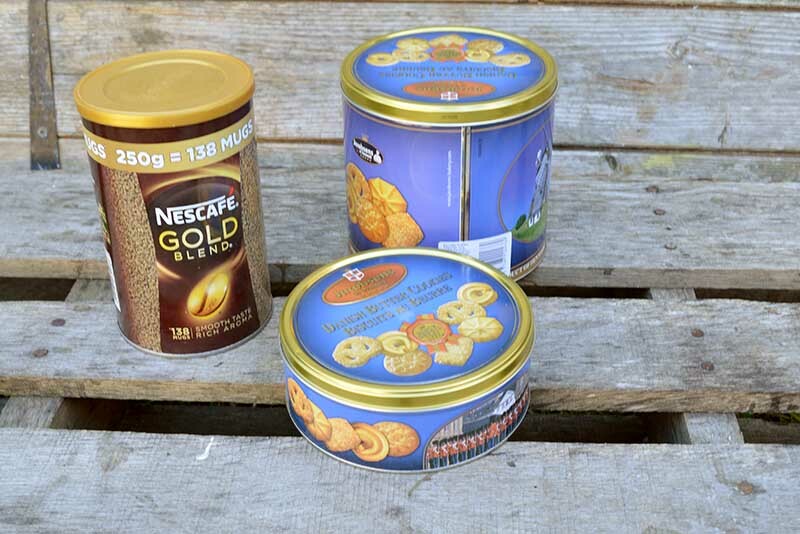 Old tins, such as coffee, cookie, and sweet tins. All shapes and sizes work well. Nail polish (not fast drying). I used a red nail polish. Firstly remove any stickers or labels from the tins. 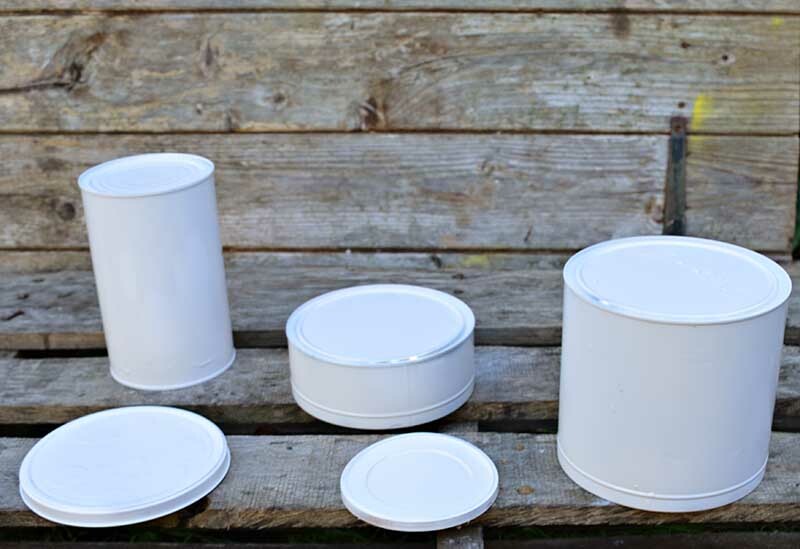 Secondly, spray paint your tins and lids. I used a creamy/white spray paint and applied 2 coats. 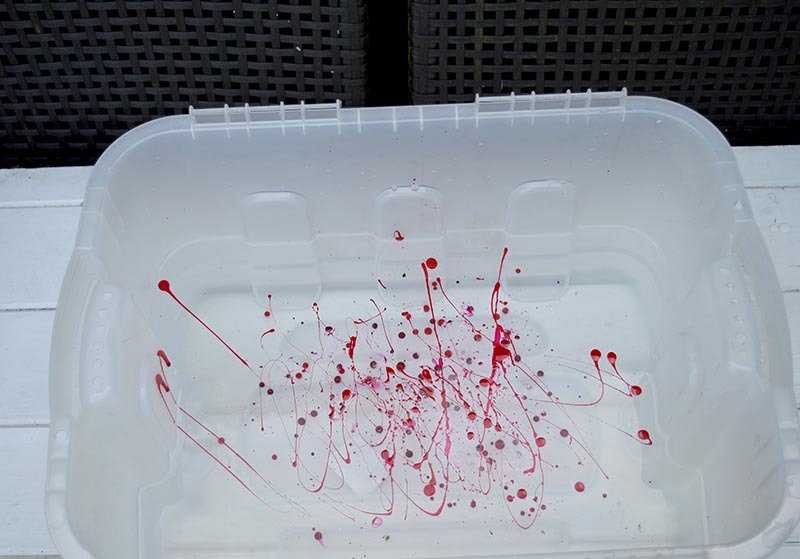 Fill the large plastic container with warm water. 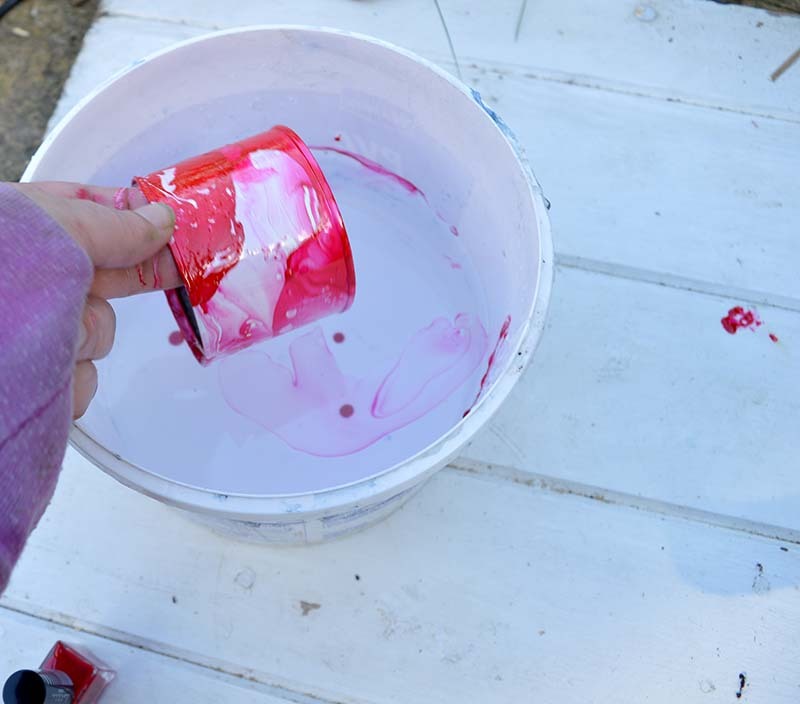 Then pour the nail polish over the surface, you may want to use a cocktail stick to spread it out a bit. Pick up your tin can and then gently roll it over the surface of the water, the varnish should cling to the surface of the tin can as you go. 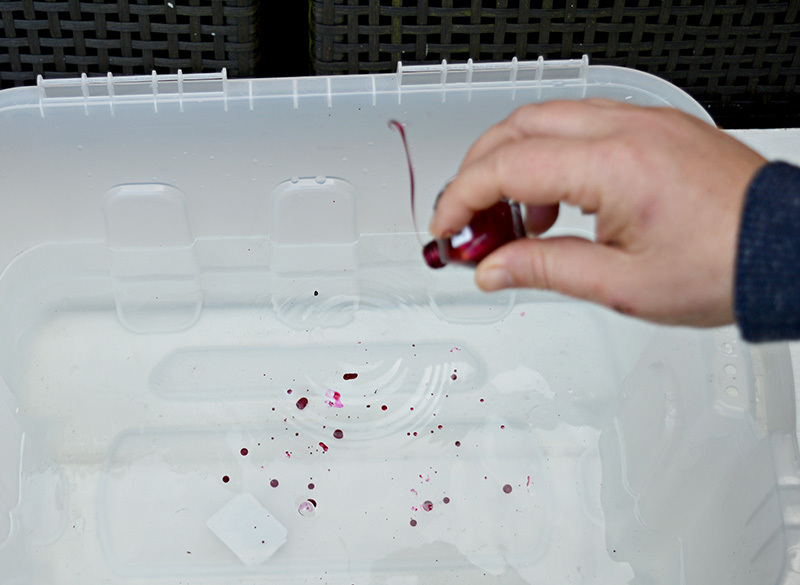 Add more varnish to the water and repeat with the tin lid. It is that easy! If you’re looking for some lovely homemade cookies to put in the tin you should try these iced oatmeal ones from Sugarbannas. You can experiment with different colours of nail polish and maybe add more than one colour at a time. I do find though that a white or cream background gives the most dramatic effect. 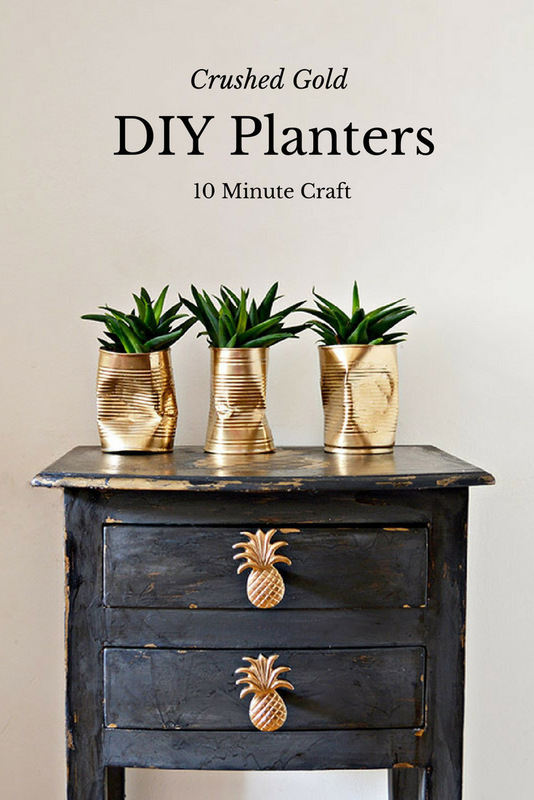 I love to upcycle tins into someting much more lovley. 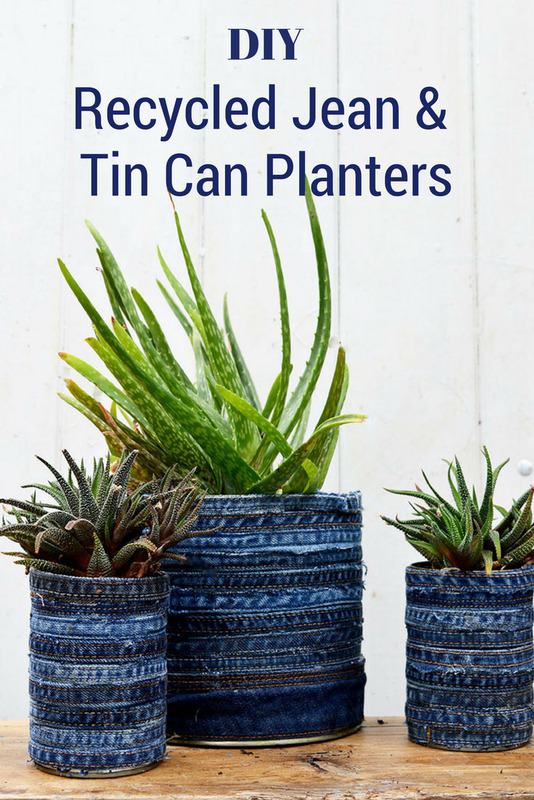 You might want to check out some of my other tin can upcycles. there is usually a smell. Should I be concerned. Nail varnish does smell so I do it outside. But once it’s fully dried the smell goes away. These are going to be great little gift holders,especially in the bright pink colour you chose. Your always so creative and your projects are fun. Ahh, that’s very kind of you to say so, thank you! Thank you so much, it is really simple to do. What a fab idea , I love this technique so I can imagine how much fun this would be. Thanks, Caro! So many possibilities and so many colours to choose from. 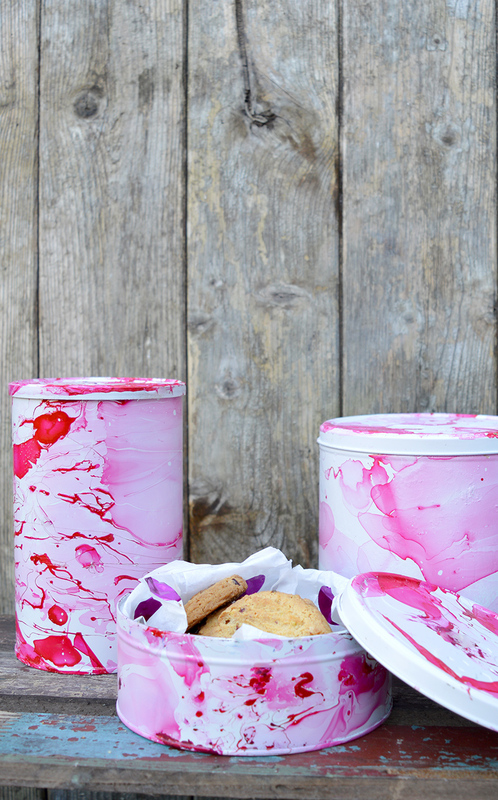 I have always wanted to try nail polish marbling; this is such a great upcycle and would be perfect for gifting off edible treats at Christmas time. I co-host an arts and crafts linky and we’d love to have you link up with us: http://www.ourunschoolingjourney.com/2017/11/virtual-refrigerator-rubber-stamp-and.html. Pinned! I made a clear acrylic tray sometime ago this way! The colors are perfect! love it Claire! 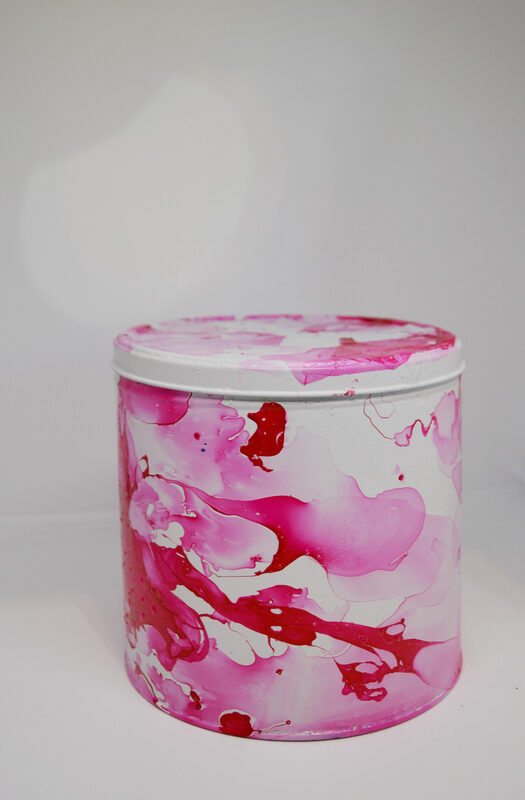 I have also been crafting with nail polish with some cute results that would be a great match for these tins, stay tuned, and thanks for sharing on craft schooling sunday! Thank you Sara. Look forward to seeing your marble crafts. Your tins are beautiful! I’ve used this technique on glass, but not sure why I never thought to use it on tin?! And wouldn’t you know I just got rid of my stash. Love your idea of using them for handing out treats. The recipient is more likely to reuse them because they’re not as specific as a Christmas tin. Take care. Thank you Cynthia. Yes they make lovely tins for all year round, I’ve actually commissioned one as our new biscuit tin. The tins are beautiful, Claire! I think I have to do some marbling soon. Thank you for the inspiration! Thank you, it is an easy and kind of addictive craft. OMG, I don’t know how you came up with this creative idea, but it’s gorgeous, and I love it. Gotta try making this. Thank you and good luck with it. I love these tins, what a great way to gift treats for the holidays. 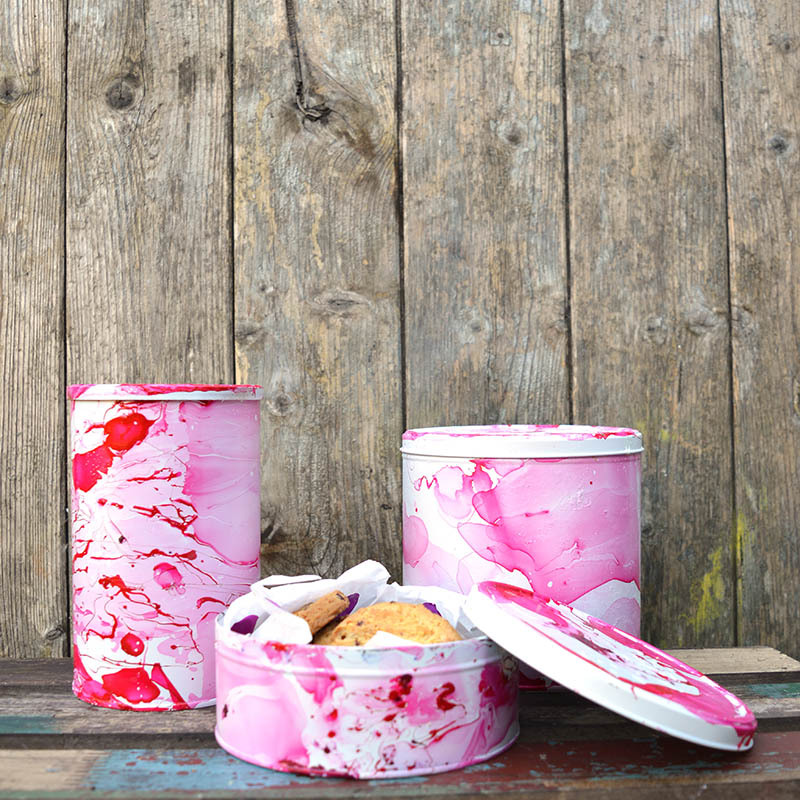 I am a big fan of marbling too and have marbled so many items, but tins are new to me. I am going to have to try this. Thanks for the inspiration. Thank you, Sarah. I can’t wait to fill them with gifts.